The Sounders began roster makeover this week, exercising 11 contract options and acquiring Waylon Francis from Columbus. 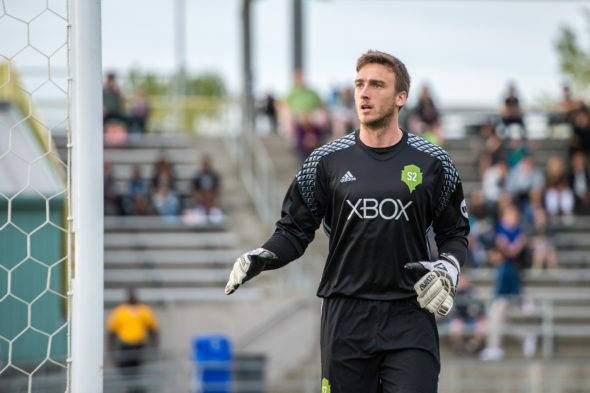 Backup GK Tyler Miller was lost in the expansion draft. It’s been a busy first few days of the off-season for the Seattle Sounders. The club exercised 11 contract options, declined another, had four players out of contract and lost its primary backup goalkeeper, Tyler Miller, to Los Angeles FC in the expansion draft. Thursday, the club announced it had acquired defender Waylon Francis from the Columbus Crew for $50,000 in allocation money. The addition of Francis, 27, will create position competition between the native of Costa Rica and Nouhou Tolo, the 20-year old Cameroonian who played his way into a starting role in the latter part of the season. Only one player, midfielder Callum Mallace, who was acquired from the Montreal Impact in August, saw his contract option declined. Brad Evans and Lamar Neagle, both eligible for free agency, also had their contracts expire along with Joevin Jones and goalkeeper Bryan Meredith. Jones is bound for Darmstadt in the German second division, while the club announced Thursday that it had re-signed Meredith. The club announced it had exercised contract options on the following players: GK Stefan Frei, GK Tyler Miller, D Tony Alfaro, D Oniel Fisher, D Chad Marshall, D Roman Torres, M Jordy Delem, M Aaron Kovar, M Zach Mathers, M Cristian Roldan and F Will Bruin. Players already under contract through 2018 include D Kelvin Leerdam, D Nouhou Tolo, M Osvaldo Alonso, M Nicolas Lodeiro, M Victor Rodriguez, M Harry Shipp, M Gustav Svensson, M Henry Wingo, F Seyi Adekoya, F Jordan Morris and F Clint Dempsey. The club said Tuesday it had worked out a one-year contract extension to bring back Dempsey back at a reduced rate from his $3.8 million per-year contract. Despite exercising Miller’s option, he remained unprotected by the club for the expansion draft.LAFC, the only club in the draft, took him in the first of five rounds. Despite Miller’s talent and potential as a starter in MLS, the dominance and relative youth (31) of Frei in front of him meant that it was unlikely the club would hold on to Miller forever. The Sounders have 23 players under first-team contracts ahead of the 2018 season. There will be little downtime for Seattle, which begins play in the knockout rounds of the CONCACAF Champions League in late February. Lagerwey hinted that there may be a few more roster moves, but it seems Seattle is largely aware of who it expects its main players to be as it seeks a third consecutive trip to the MLS Cup. The Puget Sounders need more youth and speed in their line-up. Brad Marshall on defense was a step slow most of the season leading to easy shots.